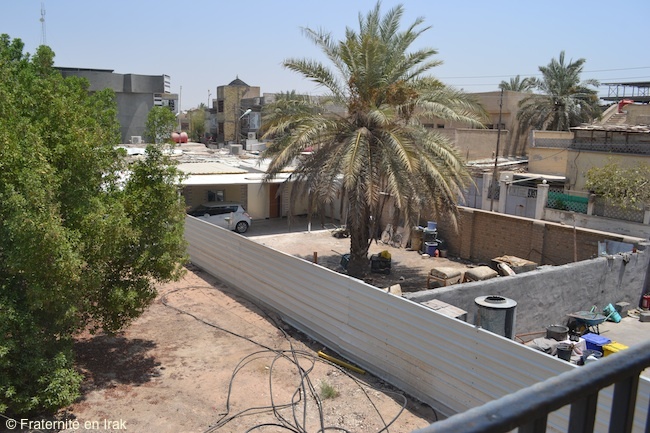 EDUCATION – In Basra, in the south of Iraq, the visit of a team from Fraternity in Iraq to the abandoned Christian communities has led to a unifying project: the construction of a multi-confessional primary school to foster access to education and social cohesion between all, Christians, Muslims and Mandeans. Early August 2016, Basra reached record-breaking temperatures with a scorching 129.2 F (54 C) in the shade! The third largest city in Iraq, located between Kuweit and Iran, in an area particularly rich in oil, currently undergoes a real economic boom. But its inhabitants’ morale is less thriving as they live in fear of increasing attacks and kidnappings. The Chaldean Archbishop of Basra, Mgr. Habib Al Naufali, welcomed Fraternity in Iraq’s team with emotion. It is the first time that an association visits him in the three years he has been in office. Born in Tellkeff, a small village near Mossul, now occupied by ISIS, Mgr. 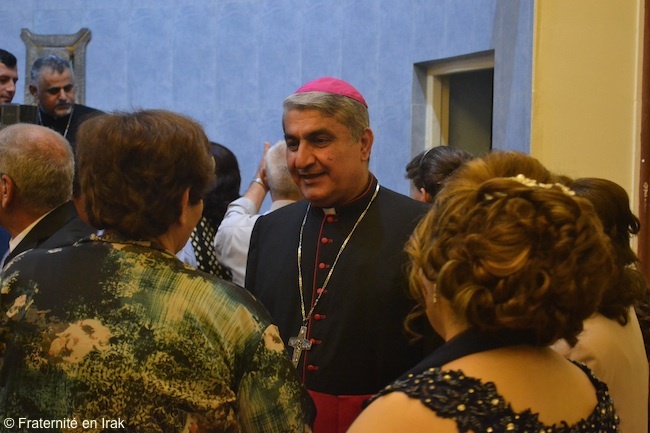 Habib was nominated archbishop in 2014 by the Chaldean patriarch, Louis Sako. He is one of the supporting bishops who want to help Christian families stay in Iraq. Full of faith and hope, Mgr. Habib is supported by two priests who lead the Chaldean community of Basra, and more generally the different Christian communities. And hope is really necessary here, because “the Christians of the south of Iraq feel abandoned in the tragic history of the country’s Christians”, explains the Archbishop. In these mainly Shiite areas, they try to survive despite the rise of extremism and its consequences. “From almost 1.000 families in 2003, there are only 200 left today in the city”, he underlines. 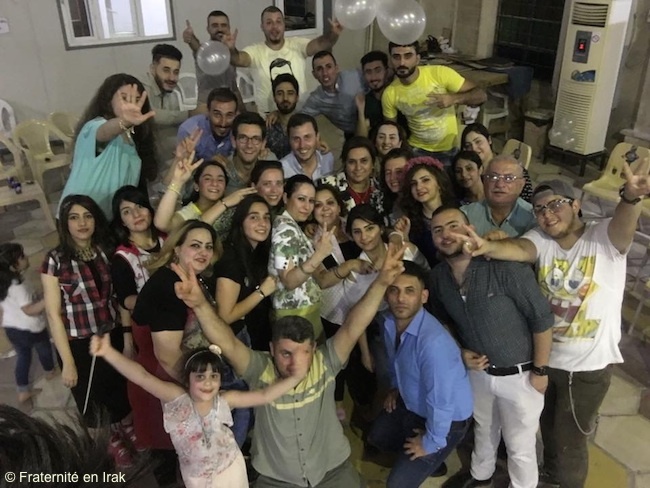 In Basra and its surroundings, the team from Fraternity in Iraq, in line with the association’s mission to help all minorities in the country, met with different Christian communities: Syriac Catholic, Syriac Orthodox, Armenian; but also Mandeans, and even a group of Muslims with old Chaldean origins, who are re-discovering this identity. The volunteers took some time to visit the refugee families from northern Iraq who landed here and live in modest trailer homes. From all those meetings and dialogs with the local leaders – political and religious, came a new project carrying hope in the future: the construction of a primary school for the children of Basra. This school will welcome the Christian children as well as the Muslim and the Mandean children. Fraternity in Iraq has been supporting a similar and very successful school in Kirkouk for the past four years. 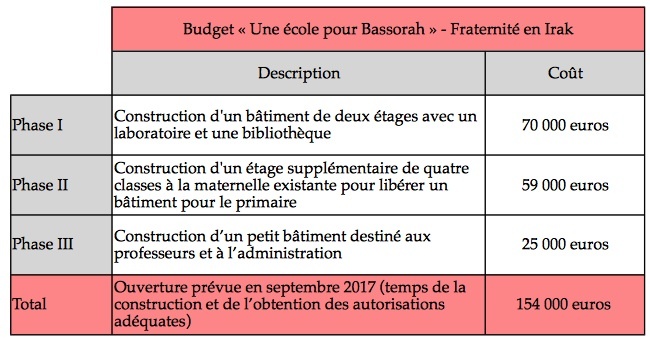 This primary school, which will open in September 2017, should be able to welcome 180 students in six different classes. 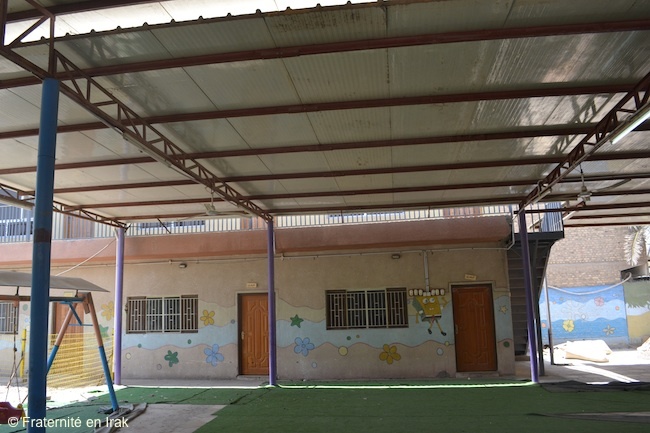 As for logistics, the school will be built on an existing field that belongs to the diocese, and that already hosts a preschool operated by two Chaldean sisters. Hence, the preschool and the primary school will be located in the same area. The new facility will be called the School of the Annunciation. This project has generated a strong enthusiasm from most of the city and political authorities in Basra, due to the quality of the teaching in Christian schools, highly recognized in Iraq. This is due to the high level of requirement of these schools – but also to their will to escape communitarian mindsets that divide the country. Beyond the educational project, this school will create dozens of new jobs. 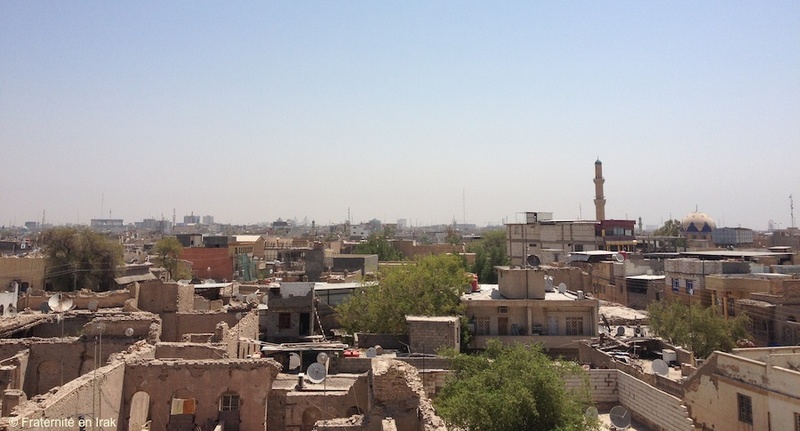 For the minorities in Basra, it will also be a strong symbol and a pacified social space. Is there a better proof of hope for the future than to take care of the youth? Fraternity in Iraq committed to fully financing this project. Fraternity in Iraq relies on your donations to carry this project to term, and open the school for the start of the next school year !